There was some slight confusion on Saturday for TV viewers when The Cool Stuff Collective moved from 9am Sat ITV1 to 8:10am so a few people think I have changed into Hannah Montana. Hopefully the various repeats the rest of the week will rectify the problem. The show this week was space themed and so it was worth trying something a little more scientific in future tech. So I got to discuss Solar Flares and Coronal Mass Ejections. Given the current activity of the Sun and the fact that the main news is covering such solar events it was a real honour to do big science. NASA provided some great footage too. As usual there were several points I wanted to get across. The rationale for covering CME’s was the potential harm to all our gadgets. Large waves of energy bombarding the Earth could seem scary, in fact they are. I think we avoided any scaremongering in talking about how there were ways to shield devices. 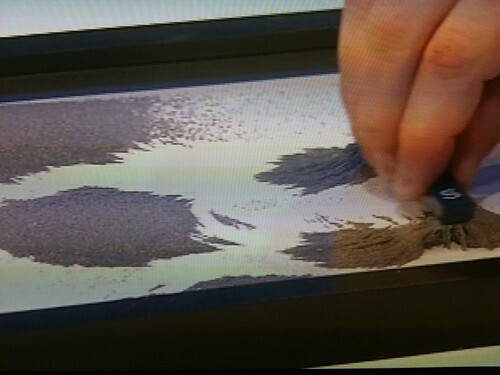 In order to demonstrate the power of this invisible wavescollection of particles I used a picture frame of iron filings lined up nicely in a row, then passed a magnet over the row and caused breakages in the visual of an electronic connection. The other part of the piece that I thought was important was that scientists need help investigating solar flares. The http://www.solarstormwatch.com/ is effectively a crowdsourcing science website. It has made an achievement driven game out of us all being able to look at solar observation footage and spot unsual activity. It is the gamification of science and very educational too. It is well worth a look. It is always good when we are able to mention something that has some follow on activity, I love the fact that the viewers can go and try something, just as with the Wikipedia show. There is much more of that to come the next few weeks mixed with some of the big gadget adventures we have filmed on the road. Another significant milestone today. 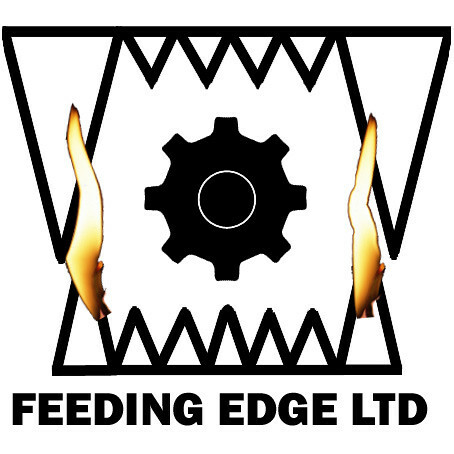 Feeding Edge Ltd is now two years old. It is something I am extremely proud about and when I reflect back on this year it has been so varied, there have been some challenges but the worst of those have been resolved. For the most part it has been such an entertaining and stimulating year its hard to think of it all packed into 12 months. A year ago I could not have imagined where I am at today. The diversity of which would not have really fitted into any other company. The ability to go with the flow, trust in serendipty and gut feeling has been incredibly useful. If companies let the creativity of their employees flow, rather than focus on control and crackdown then I am sure we would be be generating some fantastic innovations and growth in business. Though, selfishly, if everyone does that then it makes it much harder for me. The ultimate highlights though have to be. Forming the as yet in stealth social games and transmedia company and getting seed funding and filing the patent for the idea. The games company is a mix of having to architect design and direct some development and is very much hands on with the technology. The concept for our first product still amazes me and I am very proud of it. With a bit of luck we will get bigger very soon and we can deliver an even more amazing rendition of the concept, but to my partners in all this I say a huge thank you. I want to write more about what we are doing, but now is not the time or place. I still have a stack of code to write, but my coding partner out there is doing some awesome work making sense of the ideas we come up with for implementation. The Cool Stuff Collective has been an amazing journey too from the first conversation about being a technical advisor to being thrown into the studio to present, and now mid way through series 2 yesterday I was out with the crew filming at the Pure Tech racing simulators then dashing down to Intech hands on science centre. Being able to inspire or interest the next generation of techies, and maybe reach some of their parents with tech that is already here but seems like science fiction has been an incredible honour. 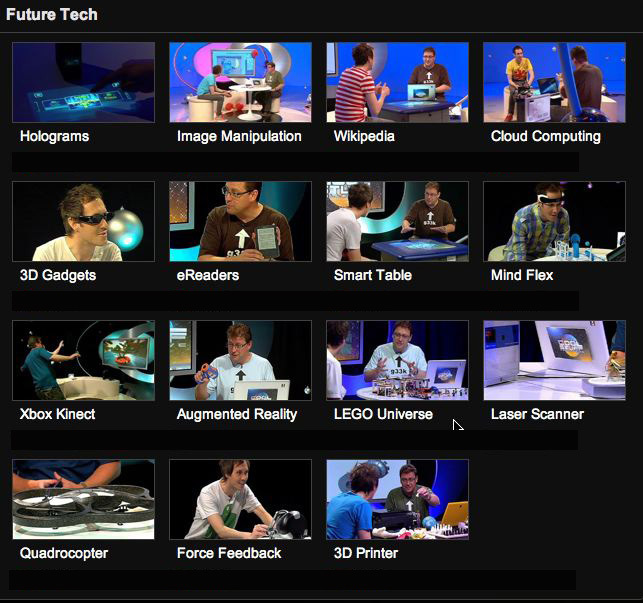 3d Printing, Haptics, Ardrone, 3d scanning, MMO Lego, AR, Kinect, Mind control, SMARt tables, eReaders, 3D cameras and glasses, Unity3d/evolver games dev, Cloud Computing, Wikipedia, Photoshop, Laser Holographic projection…. To come is Solar Flares, Opensim and the outside video we have now done indoor skydiving, indoor snowboarding, Racing simulators, science gadgets and planetarium. When people ask what it is I do and what Feeding Edge does, I think this does all some up in “Taking a bite out of technology so you don’t have to”. I think that because pushing things forward, thinking of the whole not just design not just tech but the social implications of it, but mashing in the fact that things should entertain and engage us as humans is my mission. So what does next year bring? Well for me more of the same is the answer. I am asked how I have time to do all the things I do. The answer is I don’t. Sometimes things have to slide a bit. Whilst many things seem diverse they are linked. I play games, looking at them for review, to spot trends, to see how things might be used in other gamification contexts and for enjoyment. Then I write about them, present about them and even build them. It’s all part of the flow. The same goes for the other emerging tech. If you are interesting in 3d virtual worlds, then naturally how to create 3d content, how to experience 3d content and how to use 3d environment to reach an audience becomes part of everyday life. Then there is the social media side of things. I tweet, blog, share photos on flicker, put game achievements up on facebook and raptr. It is both a personal sharing of whats goidn on to those who need to know or are curious, but it is also a social experiment in how it feels to do these things and the impact it has on my life. Having that personal experience lets me share it with others and with companies and get them to the good part of this communication revolution rather than stagnating. People I know often say to me they only understand 1/3 of my tweets. That is great as probably the 1/3 was for their benefit the other 2/3 for others. Mixing busines, social, tech and existence on one channel in 140 characters is still fascinating. It is a microcosm of the whole of what I do with Feeding Edge. So to all my customers, partners, competitors, friends, mentors and fellow virtual world evangelists I say a huge thank you for all your support. Right, back to it, now what was I do again? I got to hang out in the edit suites at MTV Camden today where the magic of TV gets crafted together from all our bits of film. John was making a showreel for the entire show to take to New York and the Kidscreen summit a version of that will get posted soon. I think I will remember Tuesday 8th Feb 2010 for quite a while. A series of experiences all came together at once and it made me feel incredibly fortunate. It is still work though! So what was I there to do? 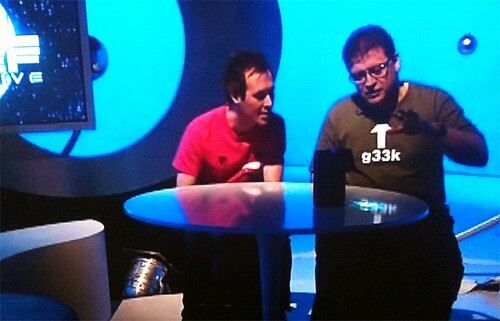 I was there to talk about a couple of giant gadgets, to camera for the show. This in itself was a new experience. It is very different talking to Sy in the studio about something I have brought in, compared to addressing a camera directly about someone else’s stuff. 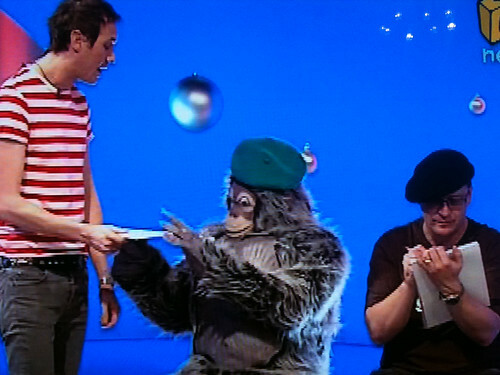 The individual pieces to camera are also broken up into all sorts of orders, multiple takes, cut aways and given its a kids show some gags too. So take away the rest of what the day was about and I feel I personally levelled up in TV presenting, but there is always more to learn! It is different to the flow of standing on stage at a conference and presenting too. I tend to present, when on stage at a conference to an audience, a stream of consciousness. I have points to hit with a beginning middle and end, but very often I don’t recall exactly what I said. These mini bits to camera have to be much more punchy, whilst you get a few takes and goes that in a way puts more pressure on concentrating on the piece. The sort of filming we were doing also was being timed with some external events too. It sounds a doddle, turn up and talk, it is fun, but not what you expect it to be. It is also a brilliant study in teamwork. The presenter is really just another paint on the canvas. The location, the look, the movement, the sounds, the paperwork/permissions and the vision of the combined piece all have to be combined by these guys. Then of course afterwards all the footage goes off for editing, so lots of what is shot will not be used, but together everyone gathers enough extra material that can make a piece work. So what were we filming? The aim was to create to on the road pieces about large gadgets and also do some action style filming. 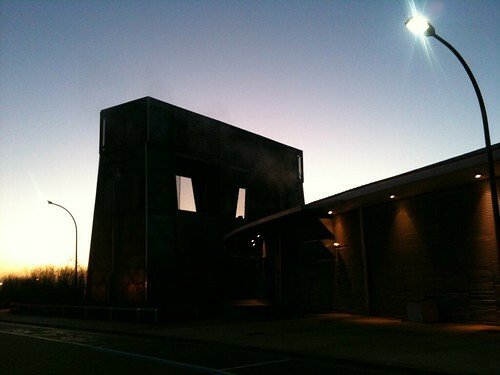 The morning was spent indoor skydiving at Airkix. Yes that right I was thrown into an indoor skydiving chamber and had to learn quickly how to do it to some degree of competence, or fail horribly and make it funny for the camera. The production team at Archie had arranged for some demonstration flying too which included the World Champion, who held indoor and outdoor titles. They went first, and to say we were all gobsmacked at the speed, precision and seeming madness of them would be an understatement. We did a filming tour of the building too, it is a massively impressive gadget generating huge wind forces. 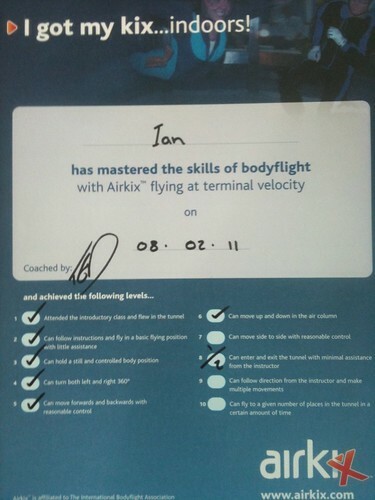 I then got kitted up and my instructor got me going straight away. It is a surprising experience to suddenly be suspended in mid air. You body position becomes critical, you are a wing. The instructor stands, and sometimes flys in there with you. It is like Tai Chi at 150mph. You have to hold a position, both with and against the wind. The instructor uses hand signals to suggest moving arms, straightening legs. once a bit stable you can turn with the slightest twist of your shoulders. Straightening your body a little and you climb. The chamber has a net you start on covering the lower section where the air is accelerated. There is a 30ft roof space and yes I did end up there in quite a surprising way, which I hope makes it to the film! Luckily it was so noisy I was not supposed to commentate or talk to camera whilst doing this too! It was incredible and a huge thanks to the Airkix staff and coaches for making the visit (and my first filming) go so well. So fresh from the rush of indoor skydiving and pieces to camera I jumped into my snowboarding gear and we spent a while on the slope doing more an more elaborate pieces to camera. John Marley (the director) was giving me some great advice on how to approach some of these. It was a brilliant lesson and I tried to absorb as much as possible. You can just talk to a camera and be natural, but there is a lot stagecraft to that. So I know there is lots more to learn. After all the links, facts, figures, getting covered in snow I then had to see if I could still snowboard. 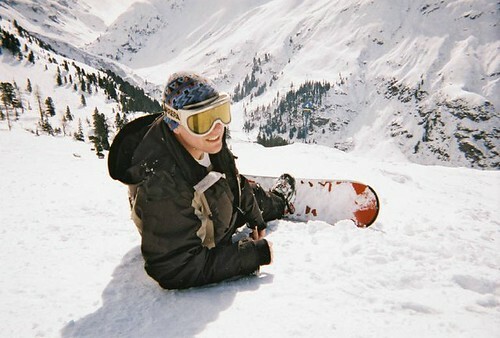 It has been a good few years since I was up a mountain on a board. 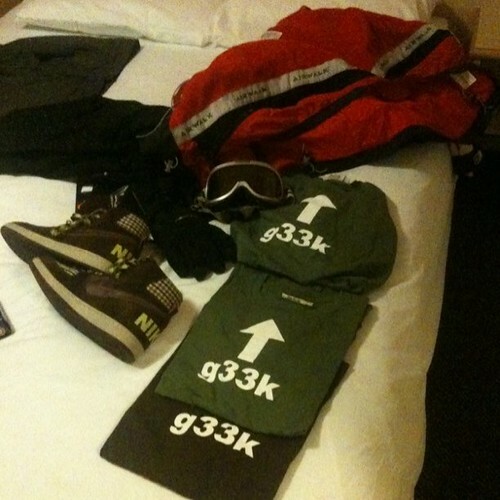 When I was kitted out one of the guys there saw my g33k shirt and asked if I had a l33t too. 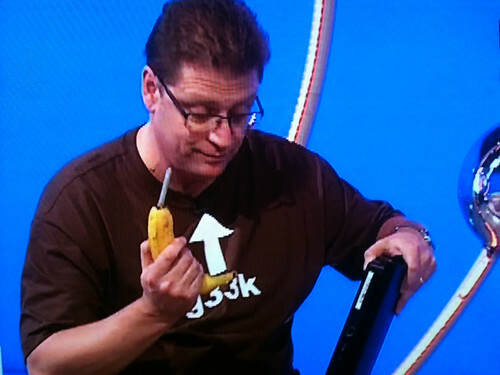 Maybe I upgrade the shirt to l33t g33k? So yes that could be considered a jolly, and rather like all the other things that look like jolly on the outside, on the inside they are exciting, entertaining and hard work in completely different ways to how you might expect. I know from my previous work at Wimbledon that when you put a URL on the TV you get a massive influx of activity to a website. It shows how intertwined computer use and TV watching actually is and something that has grown with the use of commentating channels like Twitter. It is not internet connected TVs just zooming you off to the URL but people bothering to type into their device that they have with them whilst they watch TV. 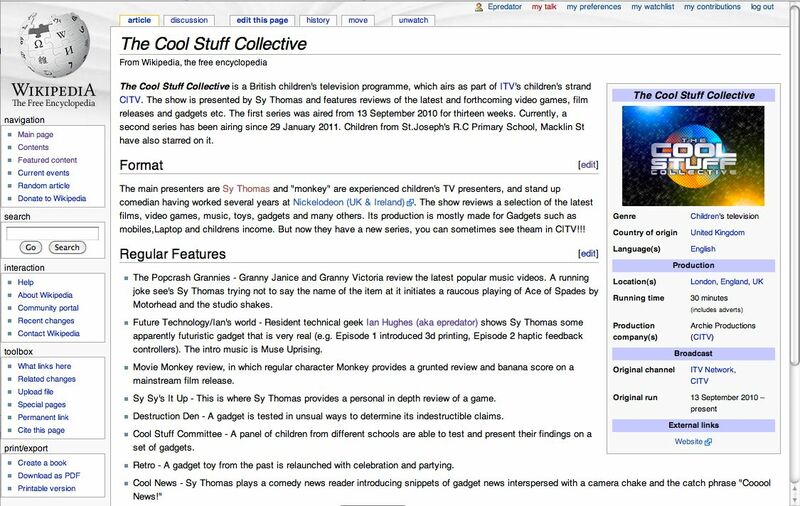 Yesterday we started airing a piece on The Cool Stuff Collective’s wikipedia page and mine and Wikipedia in general. Almost instantly we had updates getting made on the page. we did not even publish the URL on screen. I should have mentioned in the TV piece that whilst anyone can edit, not saying you are when you do edit records your IP address on the log. Clean up bots put back any hacking or vandalism. We got lots of IP addresses logged! It is an interesting feeling of letting things get on with it. Just as my page went through a noteworthy/not noteworthy discussion and passed. Watching the Cool stuff page get blanked and some offensive remarks added, having some nice, but not factual, comments added to it and even a bit of blatant self promotion from one of the schools featured. All in the matter of a few hours. This morning though it looked like the bots had got a bit lost, or maybe just given up and the page was half there so I reverted it, under my ID, to one of the more regular ones. I restrained myself from removing any of the odd extra additions such as the school reference because I wanted to stay true to the Wikipedia ideal. This is definitely one of those experiences you have to feel and watch unfold. You have to relinquish control and ego and let it self organise. It is a very different feeling to the one you get publishing to a blog, posting to twitter, making a tv show, delivering software to a customer. They all have a something about them, and they all create a different emotional response in the creator and in the receivers of that content. Wikipedia is an amazing social and technical experiment that over the past 10 years has flourished through the diligence of all its contributors and editors. The Cool Stuff Collective show 2 just started airing this week (also now on twitter as @cstuffc). 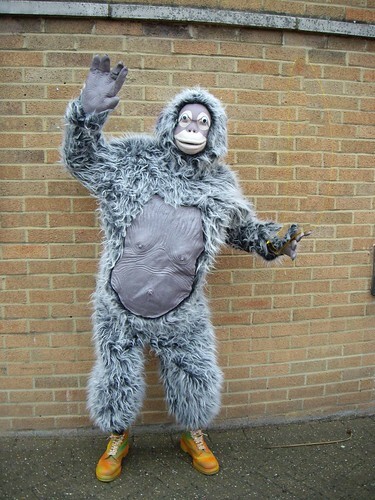 The plot features lots of comic special effects as Monkey has a magic genie in a phone and keeps wishing for bananas. In keeping with the madness of the show in general I had a few extra pieces to do over and above future tech. 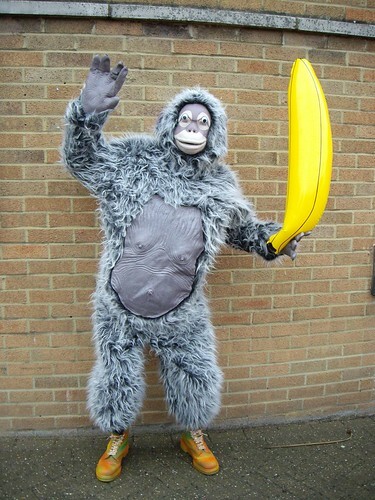 Monkey had too many bananas so we had to find good uses, mine was a screw driver for fixing a PS3. 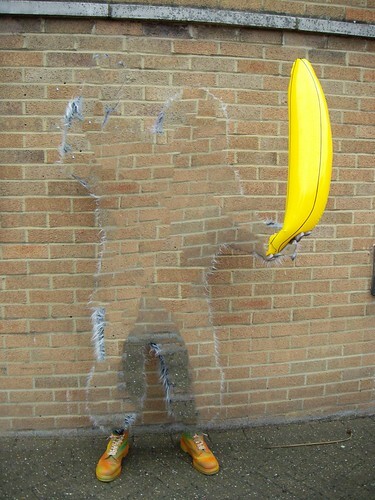 We also had a piece on the Wii tablet and pictionary so Monkey and I were busy drawing bananas on note pads. Sy then sparked up a game of pictionary and drew the clue he was given (which was not fixed just serendipity at work). 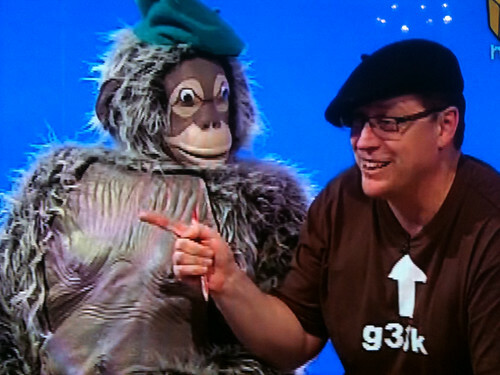 Monkey keeps guessing bananas and I finally get to guess and have the dubious honour of having shouted out “Toilet” on national television sat next to a beret wearing monkey with a beret of my own. Not something I ever thought I would type. As part of the explanation we put the Cool Stuff Collective wikipedia page up, and it was interesting to see an instant flurry of sensible edits, hacks, bizarre paragraphs and some self promotion appear on it shortly afterwards. The important edit was the currency of the new series. We shall see how it survives the rest of the week. This though shows the power of the process. Anti spam bots were protecting us as were some individuals. My page also made it up on screen so no idea what is going to go on there now. Part of this was to point out Sy Thomas did not have his page and to show the empty edit page so I hope someone takes up the challenge on the biographies needed page and writes him one. It would be an interesting school project for some enterprising teachers to get their kids involved in the contributory web to have a go at this.